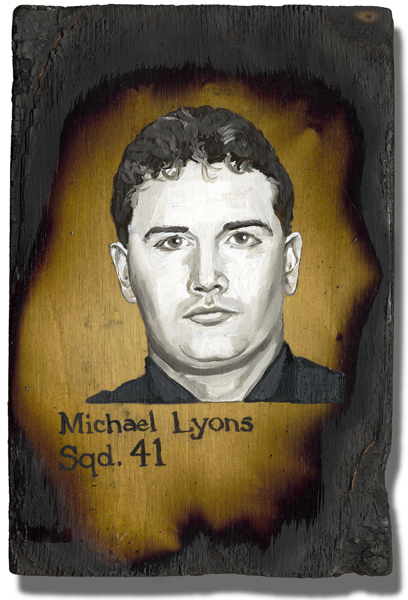 I did not know Firefighter Michael Lyons. Tomorrow I will run in the Tunnel to Towers 5k in Medina, Ohio. When I picked up my race packet today I was given his name and a card detailing his life and heroism on 9/11 and told, “Tomorrow you will run to honor Michael Lyons.” As I walked outside the enormity of the moment overwhelmed me and I sat on a bench and cried, prayed for Michael’s wife and children and asked God to give me strength to run hard and finish strong so that I might truly HONOR Michael. I am not worthy of wearing his image and name on my race bib tomorrow. His life and heroism stand out FAR beyond my poor power to add or detract and certainly running a 5k in his name falls woefully short of honoring him properly. That said, tomorrow I will run hard, I will run fast and I will run with a heart motivated by the memory of an American hero – Firefighter Michael Lyons. Thank you sir, I did not know you by name before today but I will NEVER forget you.